Chris and Barb are AMAZING. They were super sweet, responsive, flexible and professional. The food they make is delicious. Every single guest raved about the beef! Not only do they cater food for weddings (We had 190 at our wedding) but they have a diner in Cannon Falls -- the diner is amazing. They are such wonderful people and they make delicious food. I would highly recommend Chris and Barb to every bride and groom. The only thing more awesome than Chris and Barb is their food, maybe. I wish I hadn't been so busy being a groom I could have gone back for seconds, thirds, and whatever was left on the sides of the serving dishes. Chris and Barb were great to work with! They catered our wedding at the Cannon River Winery for 220 people. Guests raved about the appetizers and the food. They are super flexible and are just really nice people. Can't say enough good things about them!!! Our first impression, spectacular! We put in a request to meet with them and told them what we like/were envisioning for our wedding. We love spicy food, but we knew not all our guests felt the same way. We went to our taste tasting (we also brought my parents along) and were amazed! They brought us so much food to try and everything was delicious! It made it that much harder for us to make our decision for our menu. Chris and Barb could not have been more pleasant either! They are super personable, they answered all our questions, were quick to get back to our emails. Honestly, I cannot say enough good things about them. Any time we are in town we stop and eat at their restaurant because the food is amazing and the service is great! Eventually we did decide on our menu and decided to go with a buffet. Our menu consisted of Cajun shrimp penne, Caribbean jerk chicken, red potatoes, green beans, Caesar salad and bread. The kid’s meal was mac and cheese, chicken nuggets, carrots and applesauce. They provided our napkins and a coffee bar. They also served our guests, which made it seem classier in my opinion. All of this was super affordable for a wedding; I was shocked (especially since the food was amazing). They also went above and beyond by helping me out for no extra charge! I had asked them if they would put out our dessert (a cookie bar) and milk (the cartons kids get at school) and they said “of course, no problem at all!” People are still telling me about how delicious the food was at my wedding! 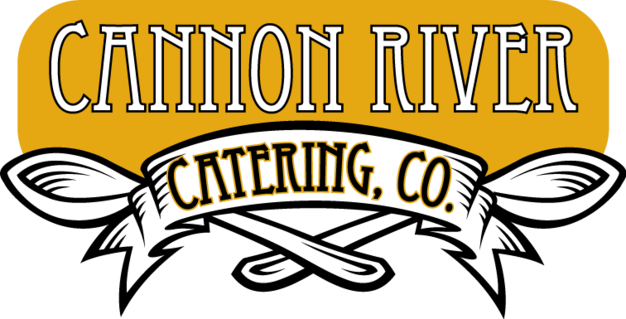 We truly recommend Chris and Barb, they are truly wonderful and they know how to run an amazing catering company!